Making a wishlist on Wednesdays is a very dangerous thing this time of year. Spring clothing is everywhere, and I constantly have to remind myself the difference between want and need. Do I really need a pair of green jeans? (Apparently I do. Thankyouverymuch Target.) How about another cardigan? That’s a big fat no. Yet I can’t stop myself from wishing. Because of the beautiful weather we’ve had lately, pretty spring dresses are at the top of my list. Dresses are so easy to wear—they’re great for layering, like I did today, but they’re just as cute on their own. I’d love to grab a pretty printed dress or two to wear now with boots and a blazer, and in a few months with a pair of my favorite sandals. 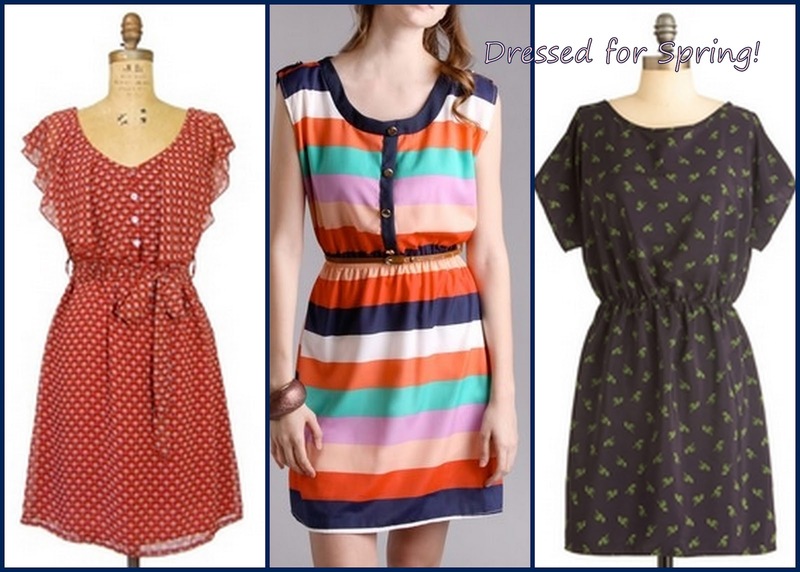 These three I pinned (from Spotted Moth, Frock Candy, and ModCloth) would do the trick quite nicely. Does spring weather make you want to throw on a dress as well?